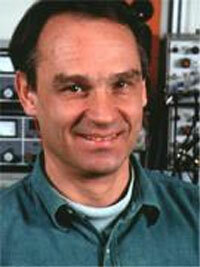 Gerd Binnig is a physicist at IBM’s Zurich Research Laboratory. He is best known for sharing one-half of the 1986 Nobel Prize in Physics with Heinrich Rohrer, which they won for their invention of the scanning tunneling microscope (STM). The STM produces images at such a fine level of detail that individual atoms can be seen. Its development gave scientists the ability to identify and manipulate individual atoms for the first time, and has been a key factor in the recent emergence of nanotechnology and nanoscience as viable areas of research. Ernst Ruska won the other half of the 1986 Nobel Prize for his earlier design of the first electron microscope. Gerd Binnig was born on 20 July 1947 in Frankfurt, Germany. He received a doctorate in superconductivity from the Johann Wolfgang Goethe University in Frankfurt in 1978. He then became a research staff member at the IBM Zurich Research Laboratory. From 1985 to 1986 he worked at the IBM Almaden Research Center in San Jose, California, and from 1985-1988 he held a guest professorship at Stanford University. From 1987-1995 he directed an IBM physics research group at the Ludwig Maximilian University in Munich, earning a Honorary Professorship in 1987. He then returned to Zurich, where he continues to work for the IBM corporation as a research scientist. In 1987 Binnig was appointed an IBM Fellow, the highest technical position in the company. Binnig and Rohrer, who also worked at the IBM laboratory in Zurich, developed the STM in the early 1980s. The microscope uses an extremely fine probe made out of tungsten to trace the surface of the material that is to be imaged. The tip of the STM probe is only about 100 picometers wide—about the width of an atom—and is kept at a distance of about 5-10 angstroms from the surface. A quantum mechanical effect causes an electrical current to move between the tip and the surface, which can then be measured to determine the exact distance of the probe from the surface. By recording the changes in the elevation of the tip as the probe is moved, a topographical map of the surface can be generated. The level of detail in the resulting map is fine enough that individual atoms may be clearly identified, and the scanning tunneling microscope is now widely used in both industrial and fundamental research to obtain atomic-level images of various surfaces. More recently, even more powerful microscopes have been developed that use the same basic scanning technology first developed for the STM. Binnig’s work developing the STM has earned him numerous honors in addition to the Nobel Prize, including the German Physics Prize, the Otto Klung Prize, and the Hewlett Packard Prize. It also stimulated an interest in creativity on his part, and his recent theoretical interests have turned toward explaining the nature of creativity and developing technologies that mimic human thought. Binnig realized that the process through which he and Rohrer invented the STM could not be explained through extant theoretical models of how creativity functions. Binnig now argues that creativity works according to a model he calls “fractal Darwinism,” in which new ideas are generated by moving between different scales of analysis in order to solve specific problems. Over time, the efforts to solve small problems accumulate in unexpected ways, leading to the discovery and invention of new ideas and techniques. As an example, Binnig points to the fact that he and Rohrer did not originally set out to invent a new type of microscope; instead, the STM emerged as an unintended result of other research. Whether unintended or not, its invention demonstrates the importance of creativity to the scientific process. This page was last edited on 26 January 2016, at 17:49.